BIG Something performs at Mountain Music Festival, now in its fifth year. Photo courtesy ACE Adventure Resort. Now in its fifth year, West Virginia’s fast-growing Mountain Music Festival, scheduled for May 31-June 2, is adding zip-lining and whitewater rafting to its high-end ticket packages. 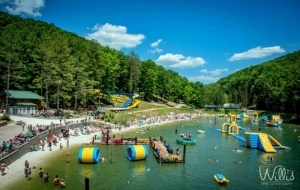 Organizers are expecting a 30-percent increase in attendance in 2018 and are improving systems that will allow more than 2,500 expected guests to enjoy the venue’s waterpark, campgrounds, and other outdoor-adventure offerings. “There’s a lot new going on this year, including the addition of rafting and zip-lining packages,” said Chris Colin, a festival organizer and spokesman for ACE Adventure Resort, host of the annual festival. Swimmers cavort at the resort’s waterpark. 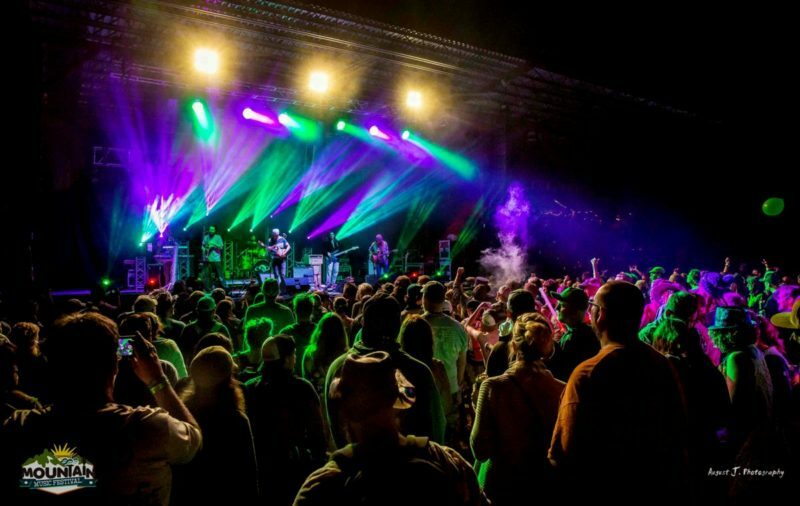 The 1,500-acre resort on the New River Gorge near Oak Hill, West Virginia, may best be known as a destination for outdoor recreation, though the spring music festival has quickly become one of its chief draws. Festival-goers may not only enjoy three evenings of live music featuring 25 bands on four stages, Colin said, but will have the opportunity to camp near the festival grounds and beat the summer heat with a plunge into the lake at the resort’s waterpark. Colin said that at their most inclusive, new VIP ticket packages for the three-day event include meals, camping, rafting, zip-lining, access to the resort’s waterpark, and access to a VIP lounge and festival viewing area. Cabin lodging at the resort is also available. Established in 1980, ACE Adventure Resort is one of the leading whitewater-rafting outfitters in the eastern U.S. and has been ranked the largest outdoor-adventure resort in the country. The Travel Channel named it top among extreme outdoor-adventure resorts in North America as a result of its size, the number of guests it hosts, and the number of outdoor recreation activities it offers. The 2018 festival lineup features Litz, The Fritz, The M.F.B., Aqueous, Black Garlic, Flat Tracker, Dr. Slothclaw, Opposite Box, 49 Winchester, BIG Something, Voodoo Circuit, Broccoli Samurai, Umphrey’s McGee, Pimps of Joytime, The Kind Thieves, Short & Company, Travers Brothership, Perpetual Groove, Union Sound Treaty, Electric Orange Peel, The Manor & Friends, The Parachute Brigade, Bennett Wales & The Relief, Matt Mullins & The Bringdowns, and Paul Johnson with Corey Lee McQuade. For more information, visit the Mountain Music Festival web page. Five for Fighting to perform March 8 in Huntington, W.Va.